This week, we give a quick tip of the hat to American history. The Civil War (or the War Between the States if you prefer) started 153 years ago on April 12th at Fort Sumter. We know that whiskey was like gold on the battlefields that followed, and we were inspired to make something that a soldier of the day might drink. We set forth to create a libation using the sorts of ingredients that were realistically available at the time. And so we made the Fort Sumter. We started with bourbon as the obvious base. We both figured fruit brandy would have been a very common thing, as would wines like vermouth that have been amended in some way to make them keep better. And bitters were a fairly typical home remedy for a variety of ailments. We tried a few different kinds of brandy and bitters, and settled on pear and cherry respectively. The pear really brought out the spicy notes in the vermouth, and the bitters played up the vanilla and red fruit in the bourbon. Then we had to settle the issue of proportions. The pear flavor from the brandy is quite strong and overwhelmed the vermouth until we had tripled the proportion from our initial 1/2 oz. Stir with ice, strain into a glass. Garnish with a spanked mint leaf. Nose: Pear, cherry, spice, caramel/vanilla barrel notes, hints of smoke and mint. Palate: Spice and barrel notes from the bourbon, faint mint, and a little bit of sweet cherry to start. Savory buckwheat notes between the intro and the mid-palate. Pear and cherry (especially strong for Shaun) on the mid-palate with more faint mint. Cloves, allspice, and wine notes from the vermouth in a full bodied, lightly bitter finish. We hope you enjoy this concoction. 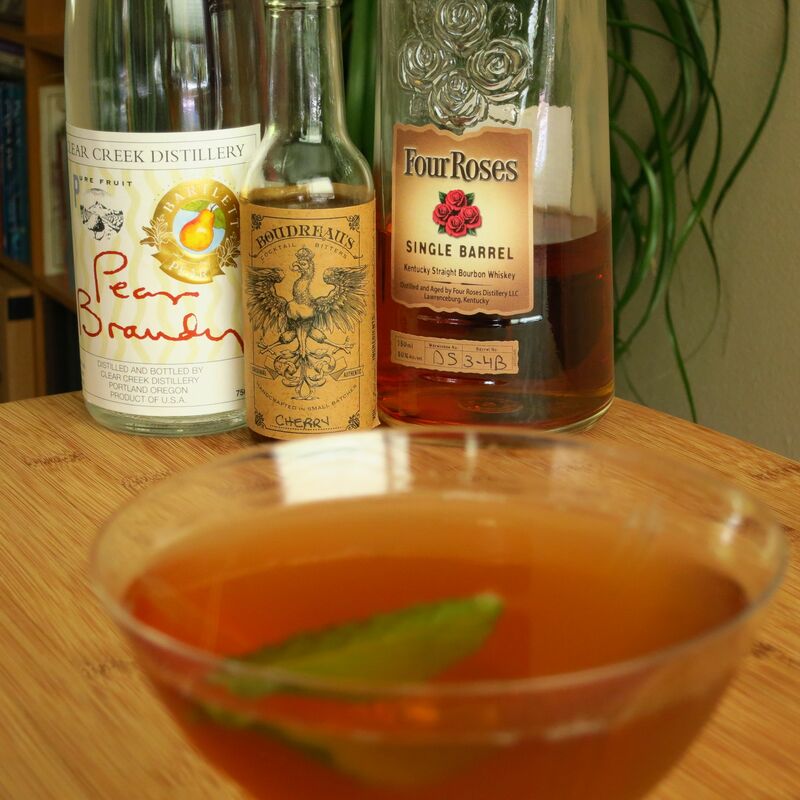 It brings together various elements of American booze history in a rather harmonious way. It’s quite tasty even if it does commemorate one of the darker periods of American history. 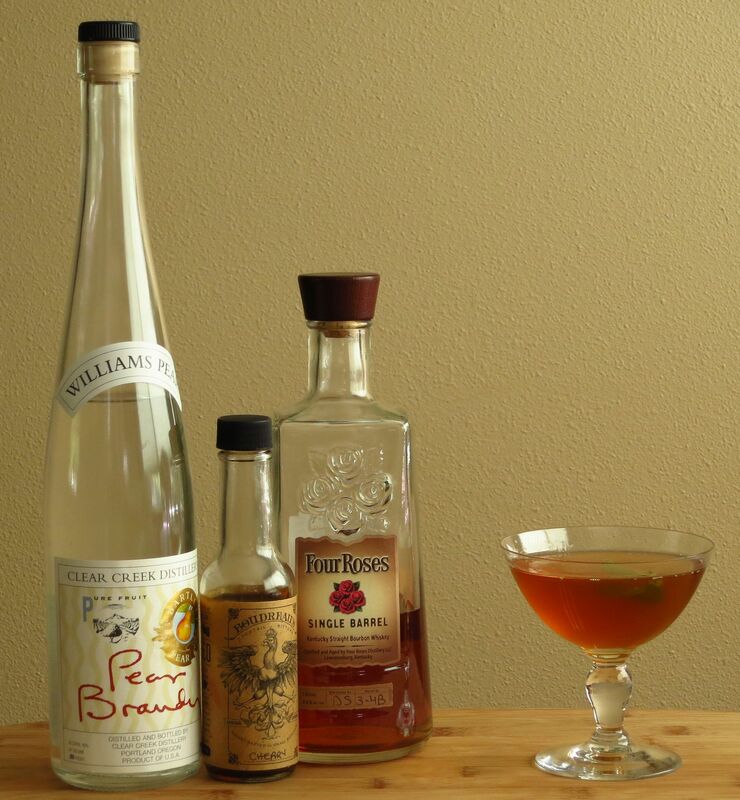 This entry was posted in bourbon, cocktail recipe, dry vermouth, pear brandy, Tasting Notes and tagged Clear Creek Pear eau de vie, fort sumter cocktail recipe, Four Roses. Bookmark the permalink.